Two weeks use of ASUS F556UA. For the price, 550 range laptops, or lower, you really cannot go wrong with it. SSD instead of standard hard drive, i5 instead of i3 cpu, this is more than average processing power, 8 GB of RAM, full size keyboard with num pad, 1080p matte screen, decent build quality. My daily computer use is checking email, working on my MS. Office, surfing Internet, and listening to music. Of course, what I am doing with my laptop can be different , but I think, to the most of laptop owners, it is comparable. The screen is a 15 inch 1080p full-HD display, it is clear and crisp so it is easy to read your screen, but the viewing angles are somewhat limited. It has a good brightness, and is a matte display which I really like. The screen is not the best, but for the price range, you cannot expect it to be perfect. ASUS F556UA-AS54 is not a touchscreen laptop. This said, it may be a con for some people, but when I am using a computer, I use it without a touchscreen, otherwise, I would use my tablet. The speakers are a bit weak, so it won’t get loud, if you listen to music daily, get a headphone or even external speakers. The good thing about this ASUS F556UA is, out of the box you already have 8 GB of RAM and SSD, so you won’t need to swap or upgrade the system yourself to have above than average power. The combo between the 6th generation of Intel i5 processor and Solid State Drive are a good combination to handle most of your tasks. I wanted to test how limited the Intel HD 520 Graphic card was, I downloaded Steam, and surprisingly, it ran TF2 on medium settings nicely, and very playable. StarCraft II was a little slaggy played with medium settings, but ran good with lower settings. Decent device to game, but of course gaming power like this one, is built for more gaming than this model. The keyboard is a chiclet styled, no backlit, large, very quite when you type, yet very responsive to your fingers, and it also has a 10 numeric keys, on the side. 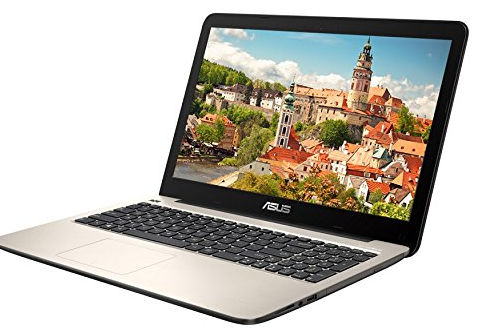 Overall, for about 500 bucks, ASUS F556UA-AS54 gives you more than you could expect, a 256gb SSD, 6th gen i5 CPU, 8GB RAM, 1080p full-HD resolution screen, ethernet, and a DVD drive.